There are 2653 reasons to stay at Transylvania Hostel when you visit Cluj. An ultra central location, newly renovated rooms in a charming building in the old town center, and a beautiful garden to chill out are just three. Come and discover the remaining 2650 for yourself. Our cozy hostel provides comfortable accommodation in a friendly and social atmosphere. We're the perfect spot for backpackers from around the world to meet, explore the city, and share your stories. With our self-service kitchen you can cook up a feast on a budget, and in our common room we sell cheap drinks to keep you refreshed or start off a fun night out. Our staff may even take you out to some of our favorite hotspots. For couples and guests looking for a little more privacy we offer twin and double rooms that are set apart from the dorms. In these rooms you can enjoy the comfort and solitude of a budget hotel while still having access to all of our shared facilities for the times when you want to socialize. We also cater to guests traveling together and small, well behaved groups. Our dorms can accommodate 4, 6, or 8 people each, and there is ample common space inside and outside for groups to gather together. PLEASE NOTE: This is not a party hostel. We do not accept stag, hen, or other party groups of any kind. Groups that cannot behave in a civilized manner will be removed from the hostel without refund. 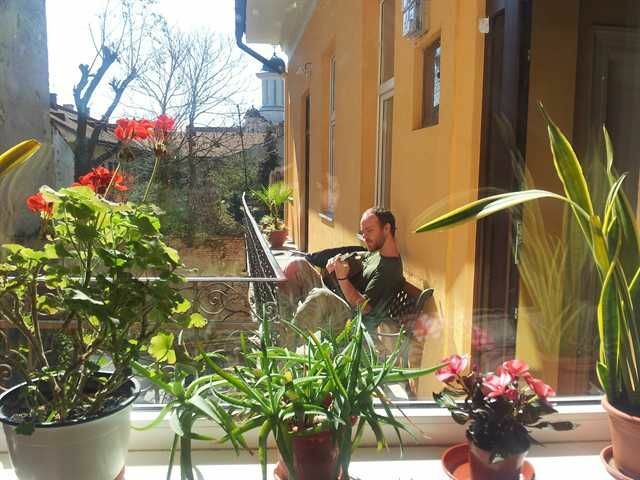 Make the most of your stay in Cluj at Transylvania Hostel. We've been expecting you! The Hostel is on the street that connects the two main Churches of Cluj-Napoca: the Orthodox Cathedral (the ''white one'') and the Catholic Church (the''brown one'').Directions:From the Bus Station: 10-15 minutesReach the street, look to your right side and you will see a huge bridge (over the raiload). Cross the bridge -the street turns than to the left. Keep walking on it around 200 meters until on the left side you will reach the train station. From there folow the indications bellow.From the train station, cross the street and take bus number 3 or 4. Get off at the third stop (the Orthodox Cathedral or ''white church'' stop). Go to the front of the Cathedral. When facing the stairs, you can see Iuliu Maniu Street on your left hand side. It should take 15-20 minutes by bus. By taxi, it should not take more than 10-15 minutes. If you want to go by foot from the train station, walk down Horia Street toward the River Somes. Cross the bridge and walk straight ahead until you see the Catholic Church (the ''brown one''). Go to the front of the Matei Corvin's statue, face it, and then you will see Iuliu Maniu Street on your right hand side. You can also recognise the street because it starts between two buildings that look the same. Iului Maniu is also nicknamed the ''Mirror Street''. By foot it should take 30 minutes From the airport you have to take bus number 8. Get off at the Orthodox Cathedral stop (the ''white one''). It should take 30 minutes by bus or 15-20 minutes by taxi.